What will you achieve when you work with us? If you are working in operations today, you know you are going to be asked for more – more growth, more cost out, more improvement – regardless of what you have already achieved. 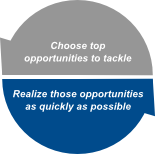 Attaining more, especially when you have less to do it with, is going to require that your organization do two things very well: choose the top opportunities to tackle and realize them as quickly as you can. We seek to understand where all of the opportunity sits in your organization and its magnitude. We tackle the most valuable opportunities with the appropriate tools, breaking the constraints that may have prevented progress in the past. And we do this collaboratively with your people so that the solutions are theirs, not ours, and, therefore, more permanent and sustainable. At the core of all of this, and in the end what makes us the best at what we do, is our Abundant Thinking mindset: the belief that more is always possible, the motivation to run after it in the face of many constraints, and the capability to lead others to realize even the toughest opportunities. Zero Based Analysis – Finds all of the opportunity in your organization. Organizations typically see three to four times more opportunity when they apply ZBA over their current view. Variable Analysis Problem Solving – All problems can be solved and the solutions are often elegantly simple. The challenge is the process of finding the root cause. How we do this together depends on your organization’s strengths, culture, resources, timeframe, and a whole host of other factors. No one improvement system works for every organization. We want to help you build or improve yours, borrowing from all of the approaches that exist, to create what will work best for you. One constant, however, is starting with early, tangible, breakthrough results. Successful change begins with step-changes in performance, not reports or lists of recommendations. Generating and sustaining a large result generates excitement and pull to do more, especially if previously thought to be impossible. It also teaches us what works well and where the organization is already strong. Path A (Success): Leading with early results and feeding off real, tangible improvements to grow excitement and buy-in is the most effective and sustainable path to transform your organizational performance. Culture and capability will be built around the results that people drive and own themselves. Path B: Research shows that greater than 90% of change efforts that invest heavily in capability and culture change without an emphasis on results fail. Wide-scale training of off-the-shelf improvement methodologies rarely builds the momentum and ownership required to drive and sustain tangible results. Explore some recent case study examples and contact us to learn more. Learn about the powerful tools we use to help you improve your operations.